When choosing new furniture, tiles or other things we are often faced with the problem, that we have to do the choice due to small color samples. This problem normally also exists by the choice of a tiled stove. We from EDER have found a remedy. 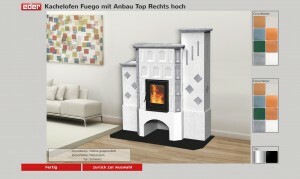 From now on everyone can give free rein to his playful vein and design his own tiled stove on www.design-kachelofen.at . You can choose from all our models of the series Fuego and Fuego Stil, that can be designed in all available options with attachments and tiles according to your wishes and taste. The use is cogitable easy: on the homepage you choose your desired model, than you select the basic color as well as the decoration color and the kind of door. Afterwards you end an E-Mail with your contact details, so that we can create an adequate offer. EDER tiled stoves base on decades of technological experience and from purchase to commissioning they are are supervised by the manufactor or a specialist trader. With the two design lines Fuego and Fuego Stil we offer suitable models for every kind of interior design. Furthermore the patented Thermosystem is unique, it makes the tiled stove especially efficient. 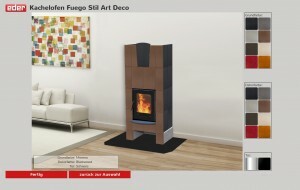 There are two possibilities for using the stove: With open thermo flap for heating the room very quickly, or with closed thermo flap to deliver heat, provided by the heating core, to the room for several hours .All these components added give an optimal synthesis of designer furniture and functional and efficient device.